Is this year’s Vasilevskiy better than last year’s? The truth is hidden behind him, where the sun never shines. There is no oxygen there, and no sound, and not much hope. There on the other side of Andrei Vasilevskiy, there is the nothingness of outer space. It is here, more than anywhere else, that the future of the Tampa Bay Lightning resides. easy to look to Brayden Point, who leads the team in goals. It is easy to look at Victor Hedman or Ryan McDonagh or Yanni Gourde or a half-dozen other members of the Lightning. But it is a goaltender's game, and more and more, Vasilevskiy looks like the heartbeat of the franchise. He is only 24 years old, younger than Jameis Winston, but already, he is a star. Last. year, he was a finalist for the Vezina Trophy; this year, he's better. Watch him on the prowl. There are few goaltenders who have his size, and fewer who have his agility. Yeah, Steve Yzerman knew what he was doing when he pushed Ben Bishop -- a fine goaltender -- out of the way to make room for Vasi. Really, he is. Oh, he missed games when he broke a bone in his foot, and so his won-loss record won't catch last season's total. But his save percentage is better. His goals-against numbers are better. He seems to fit better in front of the goal. Despite his injury, Vasilevskiy is 22-7-4 this year. At this point a year ago, he was 33-10-2, and on his way to a 44-win season. Think about that for a moment: In less than two seasons, Vasilevkiy has 55 victories. Yet, there are those who list other of the league's goaltenders above Vasilevkiy. It is as if he is punished because he plays on a team with so many stars. It is as if the analysts look at the success of backup Louie Domingue and say "see ... a dead man could play goalie for the Lightning." Now, imagine what those numbers would have been if he hadn't been injured. It isn't true, of course. Vasilevskiy is third in the league in save percenage at .926. He is sixth in goals-against at 2.44. He is second in shutouts with four. But goaltenders often are overlooked on great teams unless they are the spine of it. More and more, Vasilevskiy is becoming the backbone around here. In 33 starts, he has held the opposing team to two goals or less 20 times. In a way, it is comforting that Vasilevskiy has not played more than he has. Most of us would agree that his 64 starts was pushing it last year (he started 17 more in the playoffs, winning 11). We know this in the coming months. The offense will sputter; we have seen glimpses of it already. The defense will continue to give up odd-man rushes. Vasilevskiy will allow you to forgive both. Also, he will allow his team to win. Really, that's all you can ask. Will he win the Veznia this year? He is more consistent this year and the team has a better backup for when he is not in the lineup. 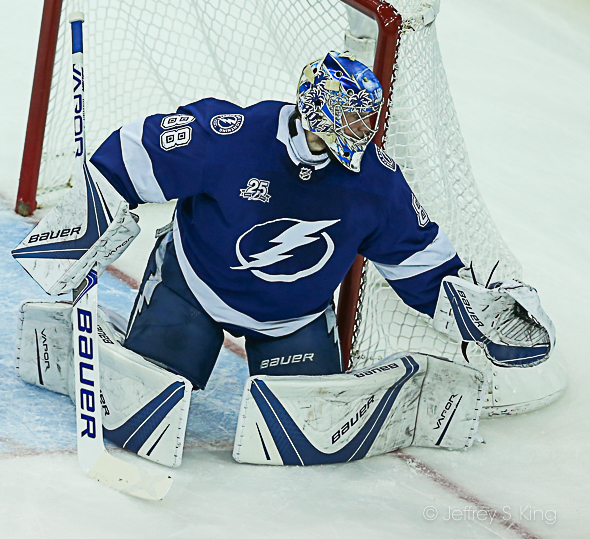 If the Bolts do not win the Stanley Cup this year it will not be because of goaltending. Vasilevskiy’s problem is that he plays on a team loaded with stars. That seems to hurt goalies in the voting. But if he has a great stretch run, he’ll be among the players who should be mentioned.